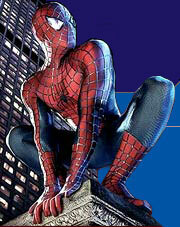 is a fansite archive for Spider-Man 3 and all Spider-Man movie related news, spoilers, gossip, rumors, events, and items. We provide free downloads, have the latest pictures, trailers and wallpaper. See the movie cast/crew stats, buy a Spider-Man poster or toy, and bone up on your Spider-Man comics history! A second official image from Spider-Man: Far From Home has been released, and it features Nick Fury (Samuel L. Jackson), Maria Hill (Cobie Smulders), Peter Parker (Tom Holland), and a mysterious device. Tobey Maguire hasn't appeared in a movie since 2014, but would he consider joining another comic book movie franchise? He talks about that and Tom Holland & Andrew Garfield's version of Peter Parker here. A new promo image for Spider-Man: Far From Home has been spotted in the wild, and it provides our best look yet at Mysterio (Jake Gyllenhaal) in his full, comic-accurate costume - fishbowl helmet included! They leaked online yesterday, but LEGO has now released a huge batch of official images of the Spider-Man: Far From Home sets featuring Molten Man, Hydro-Man, and Mysterio. Check them out after the jump. The Spider-Man: Far From Home leaks have begun, and they provide some interesting new pieces of intel about what we should expect from the first Marvel Studios movie after Avengers: Endgame. Check it out! After cleaning up all awards season, Sony Pictures' Academy Award and Golden Globe-winning animated superhero feature Spider-Man: Into the Spider-Verse has finally arrived on 4K Ultra HD, Blu-ray, and DVD! Andrew Garfield, who played Peter Parker in Sony's The Amazing Spider-Man, has offered his opinion on the animated hit Spider-Man: Into the Spider-Verse as well as his thoughts on appearing in a sequel. Sony Has A Seven-Year Plan For SPIDER-MAN Spinoffs On The Big Screen - And On Television! It seems the success of Venom and Into The Spider-Verse has encouraged Sony Pictures to place even more focus on its roster of Spider-Man characters, and there are plans for both the big and small screens. Some new promo art from Marvel and Sony's Spider-Man: Far From Home has surfaced, providing another look at Jake Gyllenhaal's Mysterio in a comic-accurate costume, including his classic fishbowl helmet.